The Caribbean is an amazing place. It is characterized by thousands of island [hey, they could name a salad dressing after that!] half of which are slices of heaven and the other half chunks of hell. It all depends on fresh water. As mentioned earlier, Haiti gets plenty of rain since the mountain ridges comb the clouds of moisture. Puerto Rico is another heavenly place. Tiny compared to the Haiti/Santo Domingo island, this island was originally called St. Juan. The town was Puerto Rico = Rich Port. This was a watering stop for the Spanish treasure ships returning to Europe after looting the New World. In those days, getting water in the barrels of a sailing ship was life or death, and it also gave the sailors one last shore leave, for drinking of the other kind. Rum and pork were the main crops in the Caribbean, with an economy based on slave labor and piracy. Did you know that the word buccaneer comes from the French “to make bacon”? I did. BTW, “makin’ bacon” is something altogether else. Since Puerto Rico was so very wealthy, it needed a fort to defend itself. One was built [and successively modernized] on the tall headland, the only entrance to the large leeward [wind protected] bay. 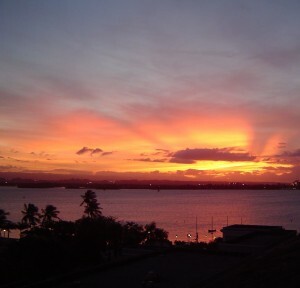 Somewhere along the years, the town became San Juan and the island Puerto Rico. I was bemused to find that some signs said the San Juan was Bautista and some said John the Divine. I suppose one could find out if one cared enough to do so, but I don’t. John the Divine was a Spanish monk who wrote “The Dark Night of the Soul.” Now that’s worth looking up. We had sailed all night and didn’t arrive til about 1 pm the following day. We could see a large island for many hours, which must have been St. Domingo. We were quite pleased to find ourselves docking in Old San Juan Piers, which meant we could easily walk to all we wanted to see. We hadn’t booked a tour, preferring our own company. As we pulled into the bay, we could see the very Mediterranean flavor: the Spanish/Moorish mix along with the Greek/Italian heritage. The streets of the Old Town, enclosed by a defensive wall, are steep and narrow and paved with the ballast stones from the many sailing ships who left these in favor of cargo. Old Town is a World Heritage Site—and these are always worth going to. We walked along the Paseo La Princessa, following the line of the beach. The small bay there was full of water craft disembarking swimmers into the waters. Families everywhere—on the boats, in the street fair, in playgrounds, parks and at the fort. Sunday seems to be a time-honored family outing day in San Juan, with a festive atmosphere and shaved ice vendors everywhere. 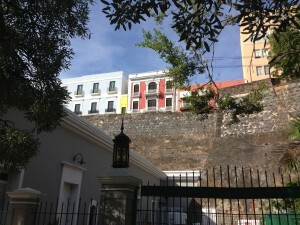 The Paseo skirts the unscale-able walls [prob 40 ‘ high] and leads past a tiny park and pier to the San Juan Gate, one of only six that penetrate the wall. There are many monuments in the city, honoring a miracle which stopped a young man and his horse from careering off the cliff; a religious procession that convinced the British fleet that hundreds of soldiers with torches were mustering on the shore; a allegory of the races and cultures that made up the current population. Ponce de Leon’s chapel and statue are here; he was the first governor of the island—after he gave up looking for the Fountain of Youth in FL. As we walked toward the headland and the fort, I began to notice many cats arrayed and later learned that there are at least 3 colonies of feral cats on the island. Volunteers care for them and collect them for neutering. And then opened before us an enormous greensward designed to make it treacherous to approach the fort from the land side [although that is how the Americans took the fort in 1898]. This day, however, the space was blooming with families, kites, cats, tourists and teenage girls floating about in flounced evening / beauty pageant gowns. The dresses were all of the same pattern made in white, aqua and pink and they were all wearing tiaras. And wearing running shoes. We thought a massive Quinceañeros, but then we saw one had wings on and another an archery bow. Thus educated, we entered the fort, presented my handi-crippled-free-pass to the National Parks [called the Golden Vulture in my family]. The guard on duty switched from a native-sounding Spanish to an unaccented English to tell us that our pass was a forgery he couldn’t accept. But of course he did. A little Park humor there. The fort is a classic design built into the rock of the headland, storing the gunpowder underground, and allowing multiple levels and angles for cannon fire. These are called “star forts” though they seldom are completely regular; gun emplacements protrude out from the walls to allow firing right along the walls. The star fort was innovative in the 1600s in that the towers had sharp angles to deflect incoming bombardment. Glutted on fort facts, I paused in the tiny chapel. It consisted of one of the casemate arches, but had a lovely Mary at the altar and chairs. I thanked God for our many blessings. Yes, I know you can pray anywhere, but I like the atmosphere of places that have long been used for worship. 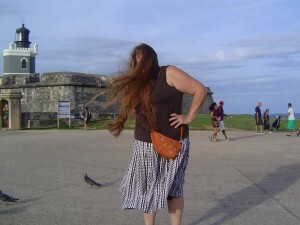 Done with the fort, we sat awhile waiting for the shuttle and savoring the wind, the toddlers and the hubbub. Impatient—we couldn’t spot the shuttle even approaching—we walked the greensward and through town by a different route. We passed the great cathedral jammed with folks celebrating the Jubileo de la Misericordia [como El Padre]—we had missed the grand procession into the church, alas. Passing a skateboard park—no wait, it was a plaza dedicated to Columbus—we discovered a small college, which, though closed for Sunday, had left their wifi on, which we promptly borrowed. We shot of greetings at US rates, since Puerto Rico is a US Territory, our first and last outreach of the trip, rates being outrageous onboard. As we wearily descended the steep street along the inner wall of the city, we chanced upon a tiny bar with outdoor seating overlooking the bay. Enticed, we enjoyed rum cocktails and the most glorious sunset imaginable with 30 of our “best friends”. No, we didn’t drink much, but it was that kind of a time and place. We ended up at the street market and bought large coconut pralines for later; and stained glass from the fellow we saw earlier. He remembered us; I don’t think he was pretending. 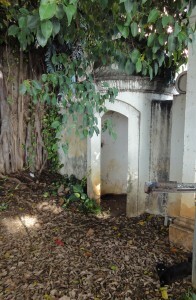 We both agreed that another trip to Puerto Rico would be worth it; there are many nooks and corners to explore. We did no shopping in Old Town and couldn’t find an open restaurant there either. We did not even get close to the new part of town. Maybe you should come with us next time. ² I don’t know why my computer starts with 2. Foamers are those who foam at the mouth with excitement at the very thought of a train; they know inordinate amounts of information about their beloveds. Whereas we like trains very much and love to ride on them, we are not foamers. ³ The Trough is my name for the all you can eat buffet on ship or shore. I have real issues with a trough and my inner pig squeals to be released. 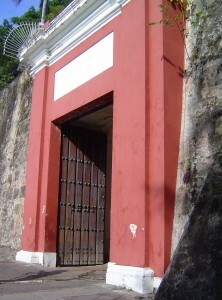 Distance to San Juan: 1580 n.m. Distance to St Thomas: 1670 n.m. Distance to St Martin: 1786 n.m.